Lunula’s clinical utility for the treatment of onychomycosis has been substantiated by independent clinical investigations. The European study consisted of 320 patients (2320 toes) subject to laser irradiation at 405nm and 635nm for twelve minutes at weekly intervals for four weeks. The United States study consisted of 54 great toenails subject to laser irradiation at 405nm and 635nm for twelve minutes at weekly intervals for four weeks. This study was used to obtain the Lunula Laser 510(k) FDA market clearance. Sixty seven per cent (67%) of all study treated toenails evaluated in this study met the study individual toenail success criteria. The average clear nail growth was an increase in 5.18mm. * Equally important, the clinical responses observed in all four trials were achieved without a single adverse event. LunulaLaser is a dual-diode, low-level laser device that delivers a multifaceted treatment of onychomycosis (OM) Lunulalaser follows the principles of photochemistry, a science that explores light’s effect cell function and behavior. The photochemical mechanism enables Lunulalaser to give a direct, non-contact treatment that produces no macroscopic sensation: no heating, tingling, burning. The mechanism of photochemistry is likened to the agonist effect of a drug, which describes the use of a certain molecule to start a secondary cascade. Laser therapy uses photonic energy to modulate secondary cellular reactions without the patient feeling the device working. LunulaLaser impressive clinical response stems from its two therapeutic wavelengths: 405 nm (violet) and 635 nm (red). Each wavelength performs a very specific function to provide a comprehensive treatment of OM. The manner in which the wavelengths are delivered represents an innovative and proprietary feature of LunulaLaser. Lunula administers the laser as a line-generated beam, which maximizes the treatment surface area. The fungal pathogen may not only affect multiple toes, but also may be found deep within a dystrophic nail or along the nail bed and root. The line-generated beam ensures that, regardless of where the fungal pathogen resides, an effective treatment will be administered. Violet has been demonstrated to have an antimicrobial effect by upregulating the production of ROS, leading to the generation of hydrogen peroxide, hypochlorous acid and droxyl radicals. When applied concurrently, the combined antimicrobial and biostimulative effects appear to provide a therapeutically beneficial combination, as demonstrated by the mean percent changes in clarity. A potential phototarget for the 405 nm wavelength is also a system responsible for catalyzing the generation of ROS, nicotinamide adenine dinucleotide phosphate oxidase (NOX). NOX transfers electrons from cytosolic NADPH to flavin adenine dinucleotide (FAD), then to extracellular molecular oxygen to generate superoxide. 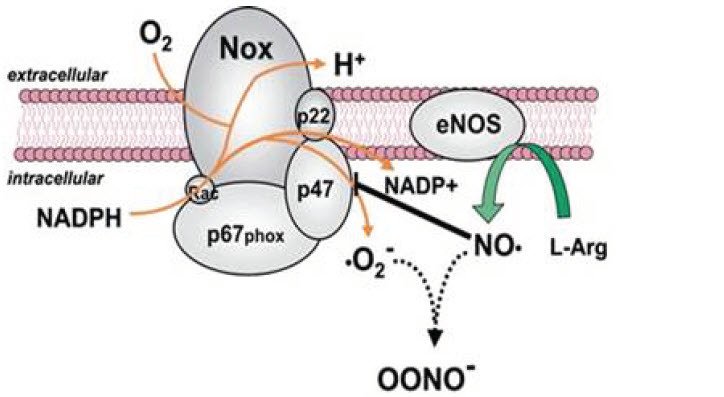 The third and fifth transmembrane domains of NOX bind two prosthetic heme groups that shuttle electrons from FAD to oxygen. It has been suggested that the prosthetic heme, which has been recognized as a photosensitizer, responds to the delivery of blue light. Stimulation of NOX could potentially provide two benefits: first, phagocytes are activated, and second, dermatophytes are susceptible to the toxic effects of ROS. 4. Is there an advantage utilizing a multiple diode approach in the treatment of onychomycosis?